Mah Gu Gai Pin means "fresh mushrooms cooked with sliced chicken." Cut off any extra fat. Cut the breasts into thin strips approximately 2 1/2-inches long and 1/2-inch thick. Add the marinade ingredients to the chicken strips, add the cornstarch last and using your fingers to mix it in. While the chicken is marinating, prepare the vegetables and sauce. Wipe the fresh mushrooms with a damp cloth and slice. Rinse the canned straw mushrooms, pat dry and slice. Rinse the bamboo shoots under warm running water, drain and cut into 1-inch pieces. To prepare the sauce, in a small bowl, combine 1/2 cup chicken broth with the dark soy sauce, 4 teaspoons oyster sauce, sugar and sesame oil. Whisk in 1 tablespoon cornstarch. When the oil is hot, add the marinated chicken. 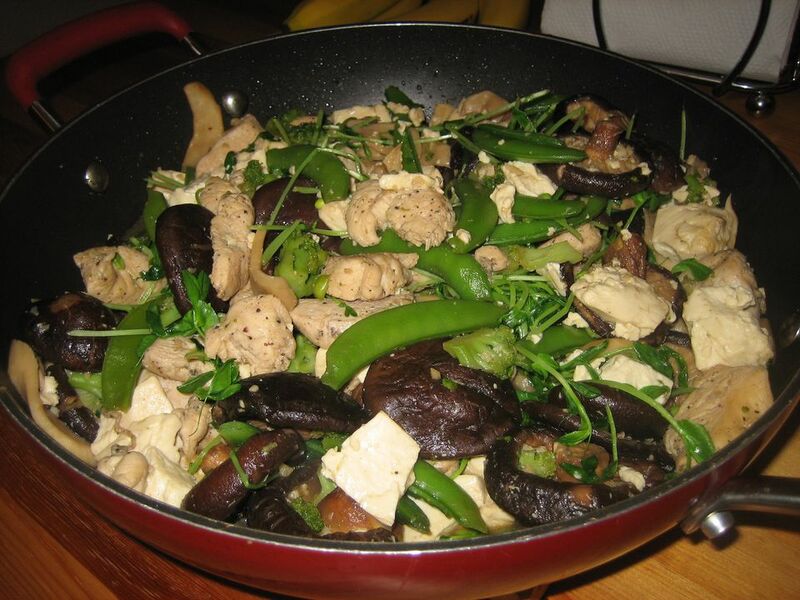 Stir-fry until the chicken changes color and is nearly cooked through. When the oil is hot, add the chopped fresh mushrooms. Stir-fry until the water begins to come out (2 to 3 minutes). Add 2 tablespoons of the chicken broth. Push the fresh mushrooms up to the sides of the wok. Add 2 more tablespoons oil in the middle. Add the minced ginger and stir-fry until aromatic. Stir-fry for 1 minute, then add the bamboo shoots. Move the vegetables up to the side of the wok. Give the sauce a quick re-stir and add to the middle of the wok. When the sauce is thick and bubbling, add the chicken back into the pan. Mix everything together, cook for another 30 seconds and serve hot.